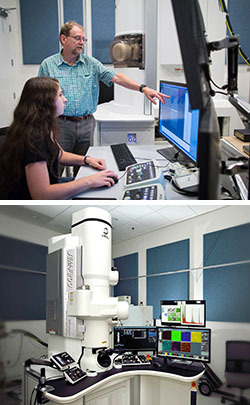 The Nanoscale Characterization Facility maintains a full-service electron microscopy facility equipped with a wide range of state-of-the-art instrumentation for materials analysis. Structural, chemical and microstructural characterization of polymers, ceramics, composites, metals and alloys, electronic materials and devices, thin films, and coatings are conducted using scanning electron microscopes, focused ion beam electron microscopes, transmission electron microscopes, and scanning transmission electron microscopes. A wide range of specimen preparation equipment is used including cryo-ultramicrotomy, cryo-plunge, jet electrolytic polishing, mechanical dimpling, tripod polishing, vacuum evaporation, sputter-coating and replication. In-house hardware and software are available for a wide range of image and spectrum processing tasks and for the calculation/simulation of electron-beam specimen interactions and microscope performance. Facility staff provide complete user training and assistance with research projects involving our instruments. The staff are also available for demand service in situations where training is not desired.